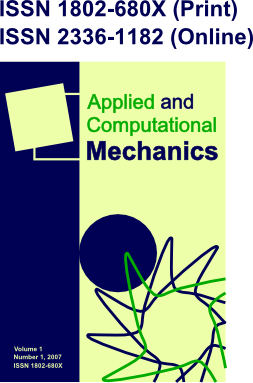 Applied and Computational Mechanics (ACM) is an open access international journal providing an extensive coverage of all fields of applied and computational mechanics. This journal publishes only original research papers. All of these papers are peer reviewed and approved by at least two specialists in their respective fields. ACM has been published by the University of West Bohemia (Pilsen, Czech Republic) periodically twice a year (in June and December) since October 2007. It is an open journal for all authors interested in the journal scope. Since January 2011, the ACM journal has been indexed by EBSCO, the largest intermediary service for publishers and libraries. In particular, the journal has been assigned to Applied Science & Technology Source database (see the list at http://www.ebscohost.com/academic/applied-science-technology-source). Since June 2013, the journal has been also indexed by the Directory of Open Access Journals (DOAJ). Since March 2016, the ACM journal has also been indexed by Scopus, the largest abstract and citation database of peer-reviewed scientific journals, books and conference proceedings provided by Elsevier. Since June 2017, each paper published in the ACM journal has been assigned a DOI number.